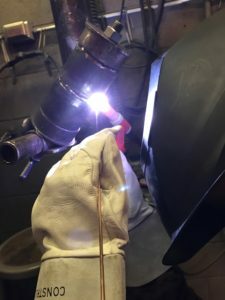 Having acquired the basic skills and knowledge in their first year, returning students will be able to further develop their welding, fabrication, and associated skills and knowledge through more advanced assignments including GTAW (TIG) processes, on carbon steel, stainless steel, aluminum and plasma project work suited to their expressed areas of interest (specialty). For some, this will include preparation and testing for specific AWS certification. Through outreach with the business community, students seeking employment in the trade will be assisted in their search. Successful completion of Welding and Metal Fabrication I and instructor recommendation.